Preparation wil gives both you and the dog every chance of success. The first learning is very important, it is so much more effective to get it right first time than try to go back and re-do. Soft, moist, low to medium value food cut into small pieces (at least 20): cooked chicken, roast beef or cheese may be good choices. If this arouses your dog too much, use something he will eat without too much excitement. Examples may be frozen peas or pieces of apple. Use their kibble if nothing else works for your dog. Remember to reduce their subsequent dinners if they are likely to over-eat, or use their dinner for delivery practise. Practice at different times and in a variety of places. 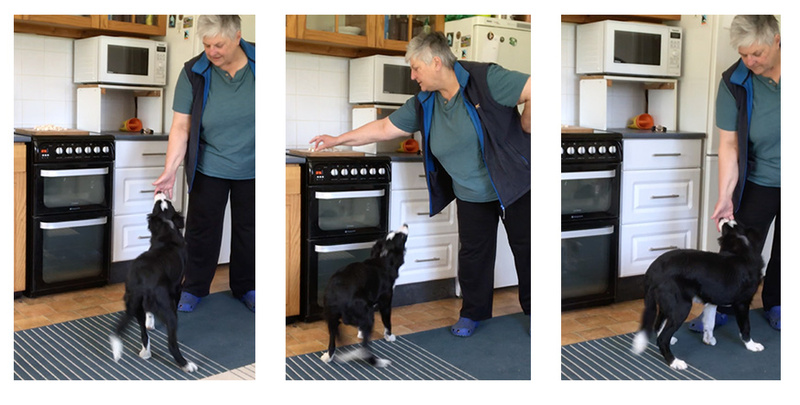 Remember to include some empty hands for the “Love That Face” enjoyment, not every hand should be giving food. Repeat these steps with anything you use to hold your training food reserve such as a pouch, vest or jacket. Keep your skills sharp by practicing delivery from a variety of reserves. your dog will certainly be an enthusiastic training friend!